Temporarily set the day/night cycle on the planet to 1 hr for a full rotation. As mentioned in the FAQ, the default is 3 hrs. Reduced time lapse makes it easier to test certain on-going visual improvements/fixes without having to use dev console cheat codes which tend to have various side effects. NOTE: This is server side, so it has already been activated in the current 00.09.08.01 live build. Activating the HAIS on the planet now uses the map interface to select a drop location. This is the same UI used in the HAIS-MK2 when drop launching from space (station or carrier airlock) to a planetary base below. Phase II. Activated AI controlled planetary defense systems (gun turrets, missiles) on ground vehicles. Defense systems (fixed and mobile) are currently programmed to engage any/all detected airborne targets which are within range. All defense systems can be targeted and destroyed; and they will repair over time, then re-activate automatically. Default state of AI controlled space and planetary defense systems. See world map. Players can now control the defense systems via any TACOPS terminal located inside the station, carrier, or at a planetary starbase. A message is displayed in the chat window when the state changes. Activation of the space defenses controls the station or carrier defense (missiles and gun turrets) systems in the local region. Activation of the planetary defenses controls the fixed and mobile surface to air missile and gun turret systems in the local region. Units within a region (space or planet) are independently controlled. e.g. the Orbital Defense Systems around the Lyrius planet, the Arkangel station and Starguard carrier gun/missile defense systems, are all controlled separately. The 3D test cockpit (used in the Aurora fighter) has been disabled. As mentioned in the roadmap, I don’t like how these turned out; that’s why we didn’t do the others yet. As we now have support for them, we’re going to redo the 3D models in a different design/style. The Incursion and Hostile Incarceration World Events are now completed. The team scoring UI for the resolution phase in Hostile Incarceration will be in an upcoming update, as it’s needed for the other remaining three World Events. Updated the game docs to reflect recent revisions and updates (e.g. now includes info about defense systems). Don’t forget to download and run the updated LOD_steam_shortcuts file. This will create the desktop shortcuts to the latest docs. For more info, see support KB52. Enabled default “passive” mode for station/carrier defense turrets. They will now only activate and engage targets if the unit (e.g. station) is fired upon and hit. Phase I. Activated AI controlled space defense systems array (gun turrets, missiles) on stations, carrier, and Orbital Defense System. Turrets are currently programmed to engage any/all detected targets which are within range. All turrets can be targeted and destroyed individually; and they will repair over time, then re-activate automatically. For testing purposes, missile damage is currently disabled. 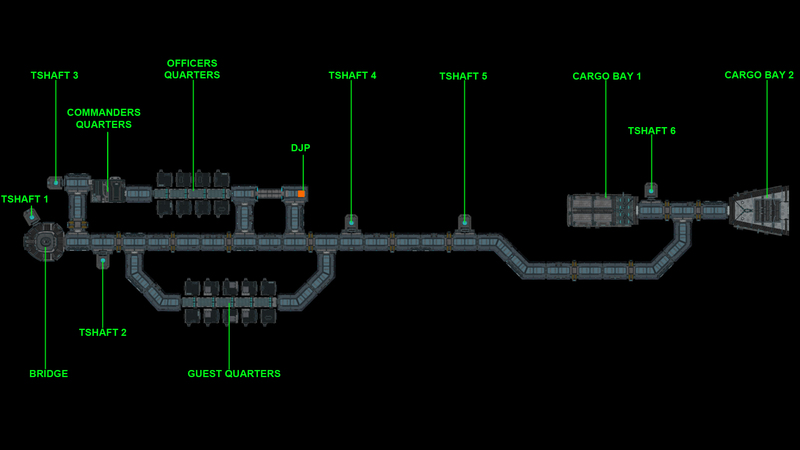 The larger map (M) for indoor scenes (station, carrier) now has annotations to show the various locations. This is on-going and so far only Arkangel and Starguard have been completed. This requires special handling due to the way the scenes are constructed and the fact that you can currently land on the Lyrius planet, but not the other planets and moons. As with flying too close to the scene border, if you approach too close to the planet/moon atmosphere, you will get a warning. Failure to turn around will result in the destruction of the ship if it breaches the atmosphere. Added new M117 assault rifle model. NOTE: Don’t forget that now we’ve improved on all the character models, we’re working on ALL the weapons. The previously done FG45, and now this M117, give an idea of where we’re going with this, without impacting the game’s performance. FIXED: The pov setting didn’t take into account the 3D cockpit (e.g. in the Aurora) models. FIXED: The pov for aircraft passenger or gunner seat position was locked. This prevents player from looking around. Some scene lighting tweaks. e.g. Nightbridge looks a lot better now. Revised the camera handling when using wingsuit/wingchute. Now allows more freedom of view/movement. Added first past scene entities with new level of detail meshes. This is part of our performance related updates. Added FX to Automated Transport System beacons in the Arkangel, Vanguard, Starguard scenes. NOTE: The ATS is currently disabled until the revision is complete. Minor revisions to the in-game and online docs. 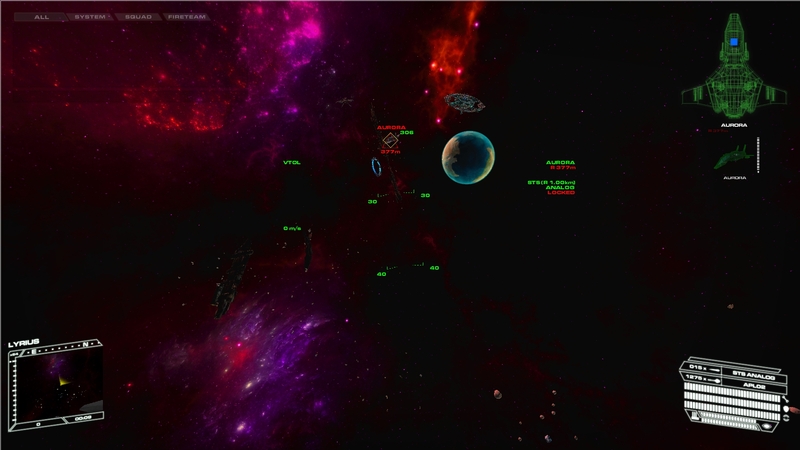 Added the space scene population count and status to deployment screen. The reason that the space scenes are handled differently in this screen is because you can’t start the game then spawn into a space scene like you can into a planetary base or station/carrier. So using the same type of icons/status for them, would convey incorrect info, and prevent access to the scene. Since each of the 13 scenes (ground x4, space x4, station x4, carrier x1) runs separately, if a space scene is off-line, the only issue would be that you can’t launch or jump to it from a station, carrier, or from the planet below. The world was designed this way specifically for redundancy and isolation reasons. Minor revisions to viewing camera. Can also now use keyboard to control orbit camera: arrow keys up/down/left/right, [ and ] to zoom, HOME reset view. Press + hold CTRL still gives quick access to the orbit camera. FIXED: Weapons appeared to be firing in the wrong direction when viewing a third person character. The animations have also been revised to address this issue. FIXED: Sometimes the ESC or T keys won’t activate due to a conflict with the Tactical Info Pad. Also, if there are no inventory items, the T key will no longer attempt to display the UI. A message will be displayed in the chat dialog. Enabled the /set_fov console command in chat box. Values are 40-120. Infantry default is 70. Aircraft/Vehicle default is 90. We have not yet made fov 70 the default for aircraft due to on-going work on the new cockpits. However, 70 is the correct setting and which solves the issue of skewed perspective (e.g. planets looking oval instead of round) in space. It will cause minor visual issues with the older 3D cockpit on the Aurora however. NOTE: THIS IS 100% UNSUPPORTED. Extensive updates to space scene lighting, object scaling etc. You can also now see the light emitting from the star in the region. It’s getting there. More graphics work planned for the space regions. Minor revisions to the in-game and online quick help and full docs. You can now also update your Steam docs (accessed via the START menu) by downloading the installer from the online docs page above. FIXED: Some issues with HAIS-MK2 suits in the Starguard and Arkangel airlocks. NOTE: The airlock is on a trigger mechanism. So if you don’t exit before it closes, pressing H to activate the suit and jump, won’t do anything. You have to exit the hallway, then come back for the trigger to open again. It’s like an automatic door. Minor revisions to GUI interfaces and user responses for interactive world objects such as T-Shaft, DJP, Jumpgate. Should be easier to interact with now. Minor revisions to game quick help and commands. Also updated the docs for printing. Chat commands (e.g. /whereami, /clr) now work in all three chat channels. Also added chat commands to online FAQ. All aircraft (fighter x12, gunship x7, shuttle x2) have now been unlocked for creation and use. If you’ve seen some of the videos from the early dev stages, now you get to experience it yourself. NOTE: All characteristics (flight dynamics (yaw, pitch, roll rates, physics etc), weapons, yoke sensitivity etc are all subject to on-going tweaks. The audio (engine, weapons fire etc) are all placeholders which are subject to replacement with final versions. Asset lock and the CTC requirement are disabled. All aircraft allow a max number of occupants. For example some fighters (e.g. Corsair) are two-seaters, while gunships and shuttles have a number of occupants as high as 17 (SC490 shuttle). To enter a craft, just approach it, point toward the seat icon and press F.
Once inside, you can switch seats using ALT+S. Press F to exit. On the planet, you can eject at any time. But if you do this at high altitude, and without a jetpack or wingsuit, you will die the minute you land on the ground. All aircraft require a pilot. If the pilot is killed or ejects, then any passenger can also switch to the pilot seat using ALT+S. Aircraft can be requisitioned (see shot) using any supply platform. These are located in a station/carrier docking bay and on the planet inside buildings, the ARC and near launch pads. As soon as you make your selection, you will be relocated in the aircraft, ready to fly. TAK tier accounts can requisition any type of air/space craft. Starter Kit accounts get a randomly selected air/space craft during any session (login/logout/login, the selection changes). e.g. 1 fighter, 1 gunship, 1 shuttle. You can currently only create one active craft at a time. Once created, you are free to fly within the scene or use a jumpgate to travel to another. Refer to the world map for info on how the world is divided and linked via jumpgate nodes. Any created aircraft, regardless of condition, left unoccupied in the scene, will automatically self-destruct after a period of time (currently set to 5 mins). Any player can currently enter and use an aircraft left on the planet. In a later update, in addition to asset lock feature, the pilot will have the ability to lock (preventing players from entering) the aircraft as well as the ability to eject (at any time) passengers. NOTE: The flight dynamics modeling is always subject to review, tweaks and revisions as things progress. The goal is not to match the fidelity of our previous flight engines. This is a totally different kind of game, that uses a totally different engine. If you want fidelity, go play any of our previous games, e.g. Angle Of Attack. All aircraft support both VTOL (C, V) and FTOL (W,S,A,D) dynamics. You are required to use VTOL when taking off on the planet. The flight control scheme supports keyboard, joystick and the Xbox 360/One controllers. Other than skill, there are no advantages or disadvantages in using either control scheme. Refer to the keyboard commands for more info. You can fly around, land/dock, exit the craft, go anywhere you like, then return to it later. For example, you could create a fighter on the planet, move to space, dock at a station, move around the station, DJP to another station or planet, return to the station and be able to re-enter your craft. Similarly, you could create a craft at a station, fly around in space, jump to the planet below, land, exit, do stuff, return to the aircraft. 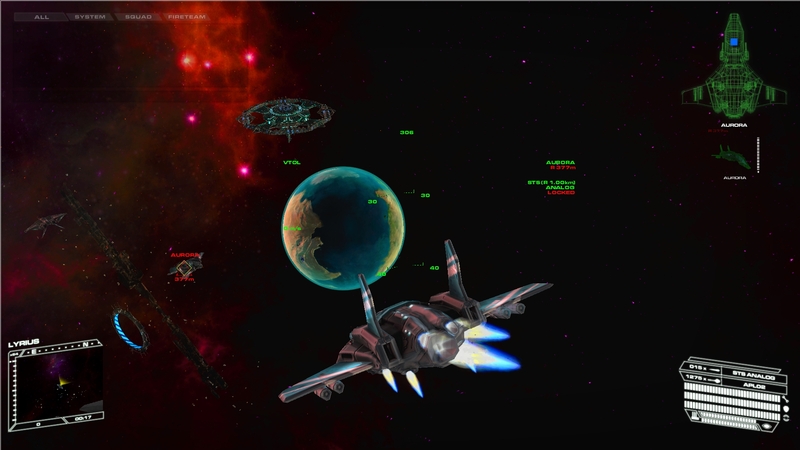 In space, you can also use hyperspace to jump to certain distant targets (jumpgate, orbital defense system, station, carrier, space craft, ship hulks). First select the target in the mini-map, then press CTRL+W to initiate the jump. The min jump range is 450m and the max jump range is 20km. All aircraft have different flight dynamics, properties, weapons, capabilities etc. They also have advanced radar, defense and weapon systems. Fighters are multi-role (can transition between space and planetary regions) and effective for space and planetary combat using a myriad of ATS (Air-To-Surface), ATA (Air-To-Air) and STS (Space-To-Space) missiles. Gunships are used for suppressing planetary enemy air and ground defenses, engaging enemy ground troops, as well as inserting and extracting infantry into combat zones. Shuttles are multi-role and used for inserting and extracting infantry into combat zones. For example you can take a team of infantry off a planet, land at a station in space and they all disembark into the station. They have weapon systems purely for defense. The hull, armor and shield modeling are active. They cannot be upgraded. If shields are depleted, armor starts to take damage. Once the armor is breached and the craft hull starts to take damage, the aircraft will eventually be destroyed. When that happens, everyone inside it will most likely die. Occupants of a craft taking weapons fire with breached armor and shields, will also sustain injury to their body armor, then their health (Life Factor). It is possible to die while taking damage inside an aircraft. NOTE: Though all assets (aircraft, vehicles etc) in the game require Energy Cells for power, for testing purposes this requirement is currently disabled. Top-Right: craft seating chart. This shows all the occupants of the various seats in the aircraft. You can mouse-over to reveal a tooltip with the person’s name. The currently selected target image is also displayed under the craft seating chart image. Mode 2/3 only. Bottom-Right: aircraft info (armor, shield, cloak), weapon info (gun, missile, ammo), energy level. Mode 2/3 only. Bottom-Left: Radar mini-map. Mode 2/3 only. When a target is selected in the mini-map, the Target Reference Indicator (TRI) will appear as a Yellow marker showing which direction to turn in order to see the target in your forward field of view. 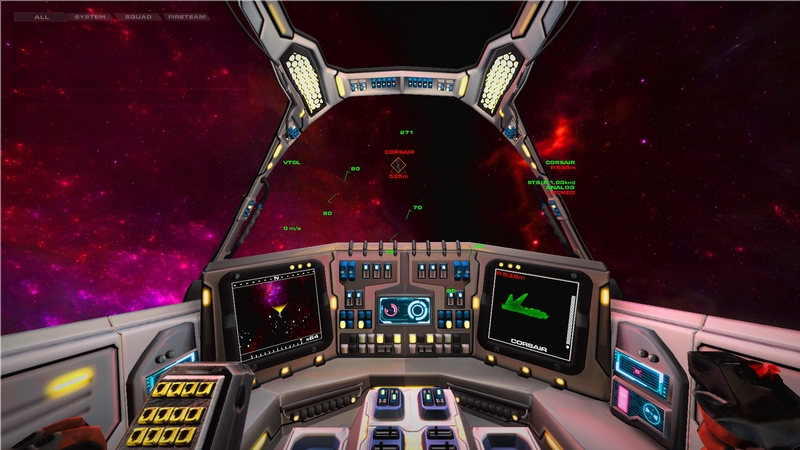 The cockpit views can be toggled with F1. If an aircraft (currently only the Aurora has it implemented) has a 3D (mode1) cockpit already implemented, then it will be the default; otherwise mode2 is the default. If cockpit mode1 is active, there are two MFDs through which five screens can be cycled and displayed using –(left) and +(right) MFDs. When cycling a mode, a caret depicting the left (<) and right (>) MFD shows which mode each MFD currently displays. During night and low light conditions SHIFT+N can be used to toggle two (Green or Red) night vision modes. All weapon (guns, missiles) systems are active and simple to understand and use. Use your controller buttons to fire guns and launch missiles. You can also use LEFT mouse button to fire guns, and RIGHT mouse button to launch missiles. Target selection is done from the mini-map using . (next) , (previous) ; (closest). Note that the select closest target command gives priority to the closest target which last launched a missile at you. Guns are standard point and shoot. The closer you are to a target, the more damage the shots will do. The mounted gun on an aircraft has unique attributes including firing rate and damage attributes. You cannot change the mounted gun or ammo type in an aircraft. There are various missiles (see the ordnance tab of the assets dB) depending on the environment. For example, you cannot launch Air-To-Air missiles in space. And Air-To-Ground missiles cannot lock on aircraft targets. All missiles have various flight dynamics, radar and damage attributes. For example, an ATA-Magellan has a quick target lock time, and does more damage than an ATA-Cluster. Once a missile is armed, the Missile Tracking Designator (MTD) diamond will appear in the HUD and move around. Select a target, and the Target Tracking Designator (TTD) box will appear. Turn toward the target so that the MTD can locate and overlap it. As soon as the target falls within the launch parameters of the radar system, the MTD will flash Yellow and beep. You will also get a message from Mother, the aircraft’s on-board computer. That is your cue to launch the missile. Missiles are all fire and forget. So once launched, you can immediately select another target. If a missile is locked on your aircraft, you will be alerted by Mother. You can use the aircraft jammer (CTRL+J) to jam the missile. The jammers are only active for 2 mins at a time; and cannot be used for another 2 mins after that. When in use, static is displayed in the aircraft HUD. The jammers are also ineffective at range greater than 600m. They are most effective at ranges less than 30m. The more evasive maneuvers you perform with the jammers active, the more chance you have of effectively jamming the missile. In an upcoming update, infantry will be able to use a Target Designator Unit to “paint” targets for missile strikes by aircraft and infantry. You can dock to repair, arm and power an air/space craft at a planetary launch pad or at a station or carrier. Fly as close as possible to a launch pad (they are illuminated Purple). Then press and hold F to repair/arm/power the craft. For as long as the key is held, the craft’s hull/armor/shield/weapons will be replenished to max based on the length of time. If you exit the area or release this key, the operation will cease. Fly as close as possible to the station or carrier and the docking bay area will be activated (Green). Then follow the same procedure as above to repair/rearm/power. If you wish to exit the craft and enter the station/carrier as infantry, single press F to dock. When you return to the craft later, the hull/armor/shield/weapons will be replenished to max. NOTE: For testing purposes, you can also repair/arm/power by jumping from one scene (space or planet) to another using a jumpgate. In a later update, it will be possible to change the missile loadout, as well as manually repair and power air/space craft and vehicles out in the field using a Portable Repair Unit. The Supply Platforms have been activated with the ability to requisition aircraft (fighter, gunship, shuttle) depending on scene (planet, station or carrier). The CTC requirement is disabled. They are located on the planet (near launch pads and at the ARC) and station/carrier (in the docking bay).Only TAK accounts can requisition aircraft using any supply platform. Starter Kit accounts can only requisition aircraft at the planetary ARC site where several supply platforms are located. Press F to activate the supply station. Then choose the aircraft to create from the list. Once created, press the LAUNCH option to be immediately transported to the pilot seat. You can then take off when ready. For multi-seat aircraft, player A must first create the craft, select the pilot seat, then wait for any passengers wishing to join the aircraft. Those passengers then use the same supply platform and select JOIN to locate any aircraft available to join. They can then select a seat. If player A selects LAUNCH, before passengers can join, then the craft will launch and will no longer be available for joining. On the planet, the pilot can land and give passengers the opportunity to get on board. Station and carrier docking has been activated with the ability to also requisition aircraft (fighters, shuttles). The CTC requirement is disabled. Fly as close as possible. When the docking bay is illuminated (Green) and activated, press F to dock. The aircraft will be moved (not visible to players outside in space) to a secure docking bay. All occupants are moved to the inside docking bay of the station/carrier. To return to your craft at a later time, go to the supply station in the docking bay and use the LAUNCH option. Passengers also need to use the supply platform. There they will see the list of docked crafts. If they disembarked from the same aircraft as you, your aircraft will be highlighted in the list. This allows grouped players to determine which of the currently docked craft they want to return to. Jumpgates have been activated, allowing aircraft to move between space and planetary scenes.No, there is no seamless spaceplanetary transition. This has been explained before in this blog post. Fly as close as possible and when activated press F for the scene destination menu. Extensive lighting (e.g. added volumetric lights to lamp posts) and tone mapping tweaks in all scenes (space, planet, stations, carrier). NOTE: that the daynight cycle (a full cycle takes 3.2hrs of real-time) on the planet is still undergoing tweaks so that there is some ambient light at the darkest of night. Replaced existing planetary scene (Heatwave, Frostbite, Gulge, Nightbridge) terrain textures with higher quality versions. Replaced male character models with higher quality versions to match the newer female character models. Optimized how looting supply packs works. Should alleviate some of the delay; especially with the Personal Weapons Pack. Instead of picking up all items after holding the pickup key for a period, items are now evenly distributed over the length of time that it takes to get max items. In other words, if you are going to take 10 items in 10 seconds, you would get one item every second. If the operation is interrupted, then you walk away with whatever you’ve already taken up to that point. The detention hold terminal tooltips now indicate which alliance can use it. Minor revisions to game quick help and commands. Also updated the docs for printing. NOTE: The in-game docs have not been updated for this build. The quick help has everything you need to get started. We also created a new quick start FAQ entry. FIXED: Player would sometimes take injury when firing a rocket or throwing a grenade. NOTE: This used to occur in some rare circumstances and it’s related to physics. We think it’s fixed now; but if it happens when firing rockets or throwing grenades, please open a support ticket and let us know. FIXED: Revised how the weapon firing works to reduce the initial delay when first fired. Note that repeat (fire key pressed) fire has a delay for all weapons. FIXED: It was still possible to use the orbit camera (CTRL key or Middle Mouse Button) to play infantry in third-person perspective. This has been disabled (still enabled in dev builds) again. This is an orbit camera only. So you can press either the key or the mouse button to activate it, then use the mouse to look around and mousewheel to zoom in/out. FIXED: Some issues with animation states (mostly in female characters) which resulted in incorrect weapon poses (seen in third person). 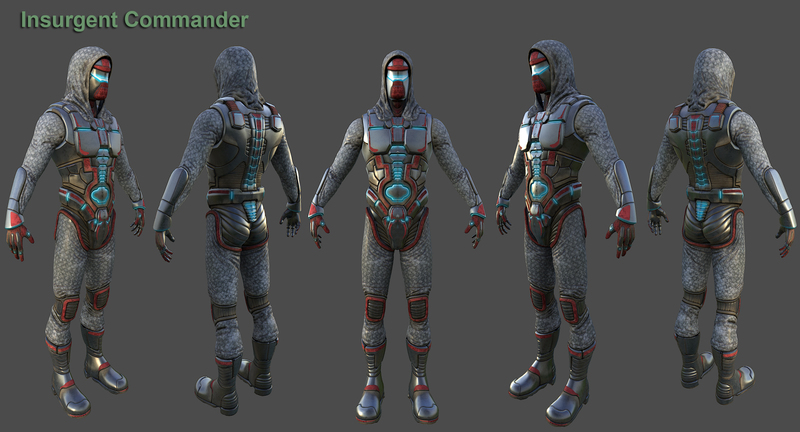 NOTE: More animation fixes are in progress as a result of the new character models and animations. FIXED: Airlocks in Vanguard, Overwatch, Templar were active, though they provided no access (they orbit different planets) to the Lyrius planet. FIXED: Various issues with the HAIS-MK2. Some issues with the Long Distance Traversal Module (LDTM). NOTE: This mode is automatically enabled after the ground to altitude arc on ground activation, during the descent phase, and immediately after space->ground transition. More info. FIXED: The lights on the planetary scene light poles were constantly on. FIXED: Various issues with player movement/swimming in deep water bodies. When you enter deep (your feet not touching the bottom) water, you can move as normal or swim. To get to the seabed, hold V until you touch the bottom. Then being to walk (movement is slower than on land) as normal. To get off the seabed, press SPACEBAR to jump and begin automatically floating to the surface. To leave the water from the surface, jetpack or move/swim towards a shoreline. FIXED: Various key binding issues NOTE: If you find some keys don’t work after you update, just reset your key bindings from within the game options screen. FIXED: Various bug fixes and tweaks. Added a Quick Access Inventory UI. Press 9 to activate it. Press the key again or ESC to exit. This is a radial menu system containing up 8 items. Later it will be possible to add items to it using the main inventory screen. 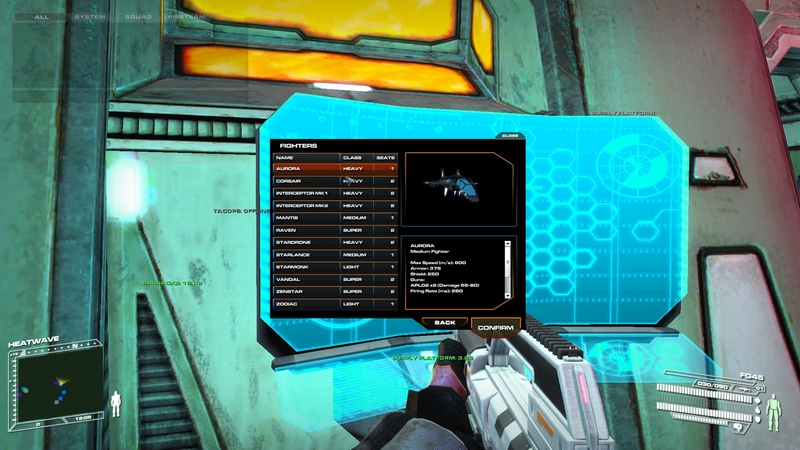 The currently selected weapon is highlighted, and a lit button next to an inventory item shows that it is currently enabled. Hovering the mouse (F2 to enable) over an item in the QAI displays info about it. Finalized the operational state of all inventory items. The Personal Shield Unit (PSU) is no longer automatically enabled and active on start, respawn etc. It has to be manually selected from inventory. Revised the in-game menu GUI. Previously some people mistook the EXIT button as exiting (you can do that with ESC btw) the menu, when in fact it quit the game completely. Now both options are clear. FIXED: During an HAIS-MK2 drop from station to planet, after loading the planet, the music track was being played while the new one was also playing. Select from inventory using 9 key. Regens at 0.50 units per second. Select from inventory using 9 key. Use Q to cycle modes. You can now use ADS (Aim Down Sight) in walk or crouch walk. Any speed increase will cancel it. Also slight weapon inaccuracy when moving with ADS active. Added unlocked Throwing Knives. These are the last set of personal weapons. Yay! Thrown knives cause damage to players when hit. After a hit, they drop to the ground and can be picked up. To use, equip the knife, then press the fire button once to enter throw mode which takes 15s. To throw, release the fire button when ready. The knife range is around 50m. Added color variation to Portable Supply Pack (Green), Portable Weapon Pack (Yellow), Portable Medical Pack (Red) beacons to tell them apart. The beacons are now also always persistent; only pulsing when new items are added to them. Added current scene name to mini-map GUI interface. Added account restriction/benefit info to Starter Kit and Tactical Advancement Kit FAQ entries. Minor revisions to game docs. Setup public access to a Dev Staging Server (DSS) for downloading and running internal dev builds. More details coming soon. This build has several New User Experience tweaks we made in order to make things a bit easier for new players. This is particularly important due to the impending release of aircraft and vehicles in the upcoming major builds. As things move along to the game’s final release next year, more NUE tweaks will be made. Added collision meshes to HAIS-MK2 suits in scene (Arkangel, Starguard) airlocks. NOTE: Since only these two scenes have access to the planet below, they are the only ones with airlock equipped with HAIS-MK2 suits. This inventory item has several uses. However in this release only the remote mine trigger functionality is enabled. Added unlocked mines (Leech, Limpet, Nucstar) to Portable Weapon Pack. Added unlocked rocket launchers (HORNET, KLMP, LR12) to spawned Portable Weapon Pack. Check the assets dB for all weapons and items in the game. See the 15-07-31 State of Play blog for notes on the current feature unlock plan/schedule. Added new in-game Quick Help (F6). Updated Steam game docs installer. Go to Start/Programs/3000AD/Line Of Defense Docs and uninstall the current version. Then see support KB52 for steps to install the latest version. Updated Automated Transport Shuttle usage in the FAQ. Latest (15-09-04) State Of Play blog. FIXED: Starguard decks are visible from airlock views. The TAK L1 tier now has the FG45 assault rifle instead of the M117, as per the original design. The server select screen now also shows the server you are currently connected to. This was done due to people not realizing that they connect to the server cluster 01 by default when joining the game. NOTE: When you start and join the game, you are automatically connected to server cluster 01. There is usually no need to switch servers, unless you think that you will get better performance on another one, or if you want to join friends on that server. The server error codes are now displayed in the game GUI. In the event of a problem connecting to the server, spawning in the wrong scene etc, these codes will help us troubleshoot the problem. The Starter Kit and Tactical Advancement Kit FAQ pages have been updated. Also now show benefits and restrictions. FIXED: GUI issues at some resolutions and 21:9 aspect ratios. e.g. 3840×2160, 2560×1080, 3440×1440, 5120×2160. NOTE: Though the game runs at 4K res, it’s not officially supported at this time. So if it doesn’t work as expected, you’re on your own. Remember that you can force any resolution you want by editing the game’s config file if you choose. See this KB article for more info. FIXED: Clients sometimes returning to main menu when trying to connect. This was due to issues related to switching to server cluster 02 from the default cluster 01. FIXED: The client sometimes crashes when starting on Starguard, using a DJP to a planetary scene (e.g. Heatwave), then going back immediately. Due to popular request, and due to the fact that we’re not going to do an open public Beta, we have unlocked the base Starter Kit so that it can be purchased ($9.99) for those who want Early Access to the game without buying a Tactical Advancement Kit tier. These keys are permanent, which means that regardless of whether or not the final game is F2P, you will have access to the game from now until final release. You can still buy a TAK tier at any time, and you will still retain the items in the Starter Kit. FIXED: Thanks to the submitted crash reports, we were able to fix several crash bugs in this build. Great job guys!! All non-square resolutions have now been disabled and filtered out. This resolves various UI issues. If you want to use a non-square resolution, feel free to do so. Here is how to do it; but it’s 100% unsupported. For testing purposes, we have relaxed the fatigue factor rules. The issue is that since we unlock all weapons and items, and haven’t enabled the restrictions on how many items can be carried, grabbing stuff from the packs (weapon, supply, medical), especially weapons which comes with ammo, increases your carry weight, which then affects movement speed and fatigue. We still allow the regular weight calculation, but simply reduced it to 25% of the total value. This gives a very good feel of some fatigue even at that maximum load, but not to the point where you’re constantly dealing with it. Sprinting from no fatigue to full fatigue takes about 15 seconds under a full load. FIXED: Crash occurs if a controller (e.g. Xbox controller) was plugged while looting packs, changing scenes, or alt+tabbing between the game and another window. Exposed additional video card AA options. We had new MSAA options exposed as well, but found some DX11 issues at the last minute. So those are disabled for now until we get those issues resolved in a later build. In preparation for our next three big updates (NPC android world event, aircrafts unlock, vehicles unluck), we’ve added complimentary aircraft and vehicle specific CTC to the Tactical Advancement Tiers. These listed below are new. The CTC list is available in this FAQ entry. FIXED: Standard keybind conflict message not always displayed when assigning an already mapped key. NOTE: The ALT keybindings tab still doesn’t report conflicts. Added additional safeguards and checks to catch rare instances whereby a Starter Kit account starting in one scene, ends up being deployed in another. This results in the client being located in an incorrect position (e.g. under the terrain) in the incorrect scene. FIXED: Crash bug with DX11 + Windows 10. If you are running Windows 10, please read this – now. Added unlocked grenades (all types) and grenade launchers (GLE22, J334B) to spawned Portable Weapon Pack. Check the assets dB for all weapons and items in the game. Added unlocked grenades. Some can be thrown, while others can be fired from the grenade launcher weapons. Added unlocked Grenade Launcher T1 / T2 attachments. This allows certain rifles to fire Weapon Launched All-Purpose Grenades. 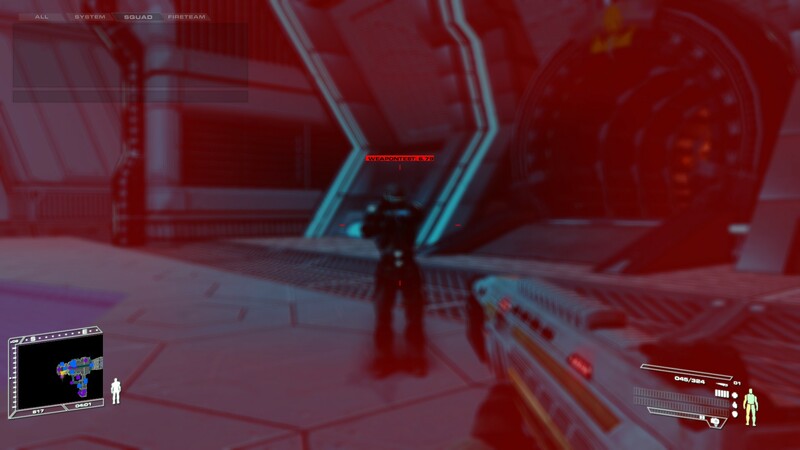 Added ping detector to game interface. Execute using /ping on or /ping off from chat console. See the tech support page for more on this. 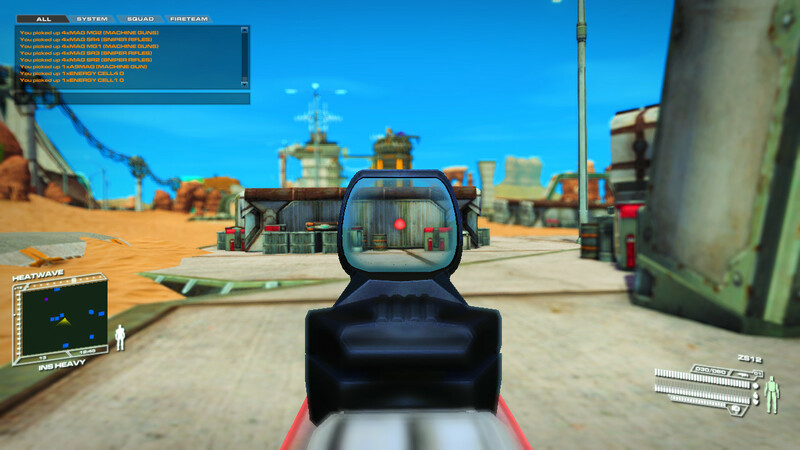 Allows players to designate a target location at a range of up to 1500m, for various types of actions. For example, to indicate where an airstrike or heavy artillery are needed, where there is heavy enemy concentration, where a sniper has been spotted etc. Added unlocked laser marker (assault rifle, pistol) and target designator attachments (assault rifle, pistol) to spawned Portable Weapon Pack. Check the assets dB for all weapons and items in the game. You can now select either attachment 1 (upper weapon section) or 2 (lower weapon section) using the – or = keys. You can still use the ALT key to access attachment UI as before. Added unlocked shot tracer attachment (machine gun, assault rifle, pistol) to spawned Portable Weapon Pack. Check the assets dB for all weapons and items in the game. Added a character silhouette (shot1, shot2) to the infantry HUD showing where (arms, legs, torso) localized (e.g. you get shot in the arm) body damage has occurred. It is also color coded (Green: 0-15, Yellow: 16-29, Red: 30+) to show the amount of injury. This will only be shown if you have no shield or armor, and your body takes direct damage from weapons fire, explosions, environmental (e.g. falling) damage etc. Note that head shots are still 100% lethal, and armor and shields offer no protection. Added ability to sprint (CTRL + W) in short movement bursts. It is currently set to 15x the run speed and ties directly into your Fatigue Factor, and increases it rapidly. Revised craft MFD functionality for all pilot and driver seat positions. Replaced legacy cockpits with holographic displays. To see this, just get in an ATS shuttle in one of the seats up front. Will be able to see these same displays when vehicles and aircraft are unlocked for testing. Added unlocked A9MAG machine gun, wristlaser, Energy Lance to spawned Portable Weapon Pack. Check the assets dB for all weapons and items in the game. Added unlocked machine guns (except the A9MAG) and shotguns to spawned Portable Weapon Pack. Check the assets dB for all weapons and items in the game. Added unlocked silencer (pistol, assault rifle) and night optics attachments (pistol, assault rifle) to spawned Portable Weapon Pack. Check the assets dB for all weapons and items in the game. 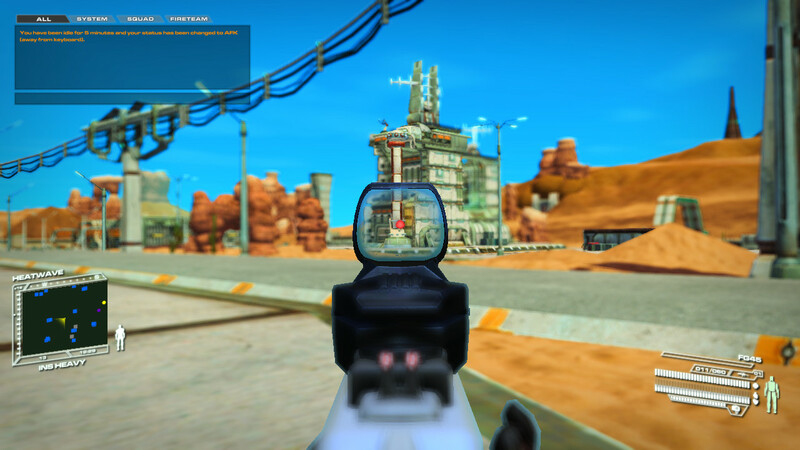 Revised Advanced Quantum Heat (AQHEAT) vision effect used in some weapon attachments. This btw, is a heat sensor. Both High Altitude Insertion Suits (MK1, MK2) have been unlocked for testing. The MK1 can be found in spawned Portable Supply Packs. The MK2 can be found hanging on an airlock wall in the Arkangel station and GCV-Starguard carrier. If you have a paid tier (Early Access or TAK), the MK2 is already in your inventory for testing. Other players with the F2P Starter Kit can obtain a MK1 from a Portable Supply Pack or a MK2 from the Arkangel or GCV-Starguard airlock room. You can only have one type of each in your inventory. In case you didn’t see these when we released them a few months back, here are two test flight videos (01, 02) showing the MK1 in action. 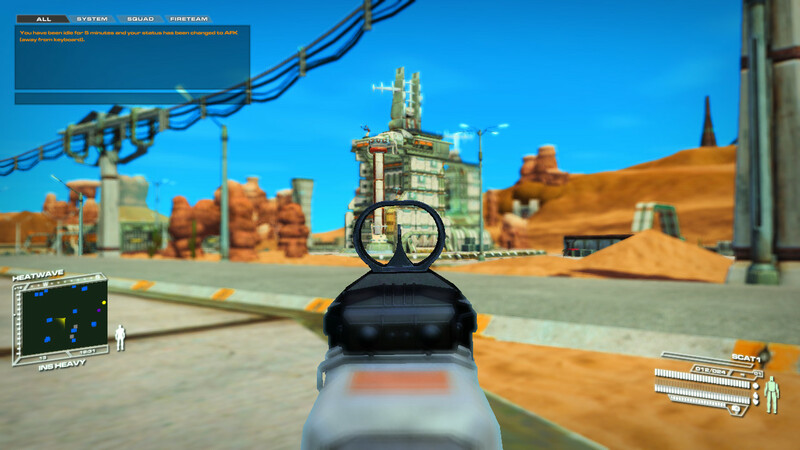 Added unlocked zoom scopes (pistol, assault rifle, sniper rifle) attachments to spawned Portable Weapon Pack. Check the assets dB for all weapons and items in the game. Added Portable Supply Packs to the game world and included unlocked items such as jetpack, wingsuit/wingchute and HAIS units. Also added armor and Personal Shield Unit. Other inventory items will be added as they are unlocked for wide testing. Minor revisions to “pack” loot drops. Please don’t forget to read up on how these loot drops work, as we’ve had some inquires about them. Revised shuttle (SC490, K19XZ) cockpit models. This is on-going as we experiment with the shuttle ones for now. Look in the Steam’s game install folder e.g. Yeah, nuthin’ to see here. At all. FIXED: Fullscreen client resolution issues on 4:3 displays. More info in this support KB article. If you have a Tactical Advancement Kit, you will be able to select any of the valid deployment locations, otherwise you will only be able to deploy aboard the GCV-Starguard carrier. If deploying aboard the GCV-Starguard, TER/MIL deploy in the Commander’s Quarters & Officers Quarters, and TER/INS deploy in Guest Quarters. These locations are located on deck 1 of the carrier. From there, you can use a Dynamic Jump Pad to proceed to other parts of the game world. Revised the 3D cockpit lighting in aircraft. Still not quite there yet; so this is on-going. Removed all stand-alone test items spawned in all scenes. Only packs are now used. Portable Medical Pack (MedKits only), Portable Weapon Pack (weapons, ammo). 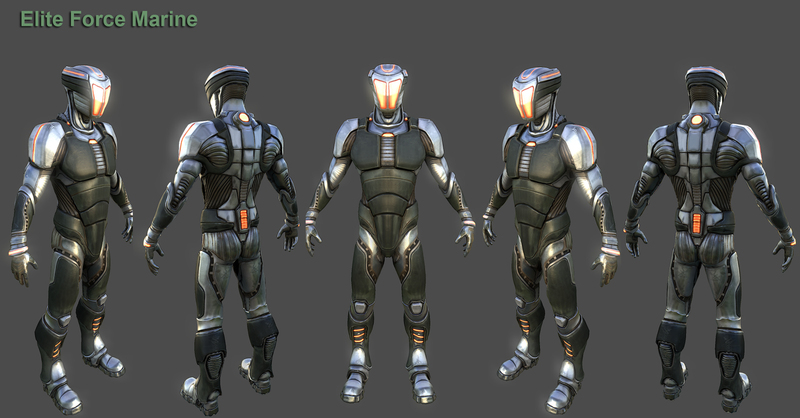 The Portable Supply Pack (energy cells, implants, medkits) is coming soon. So if you are looking for a TKR9 and Hostile Incarceration Darts, look in the PWP as they are no longer spawned separately for testing. Revised the ice shader used in Frostbite and added new ice chunks and glaciers that use it. Added a small terminal inside the GCV-Starguard detention cell. Once activated, it will later be used by players with “Advanced Programming Spec II” Combat Training Cert (CTC) to hack those terminals faster (7 secs) than players without. Added in-game music from our stock music library. Revised the OPTIONS tab in the game launcher. Also added music playback controls. Increased (doubled) mouse sensitivity percentage range maximum from 1.5x to 3x in game OPTIONS. Added /online console command which shows the number of people logged into the current server. The launcher is now set to use the game’s default min recommended resolution of 1280×720 (720p). Various updates to the website including updating and adding several FAQ entries. Also added online searchable versions of game docs and all in-game maps to the game’s info page. Updated in-game docs to reflect recent command revisions and new functionality. The print versions have also been updated. Unlocked Starter Kits for F2P mode. Each faction has a specific set of items. This can only be upgraded by purchasing an Early Access tier during the Early Access period or a Tactical Advancement Kit tier when the final game is released. Unlocked TKR9 weapon which fires Hostile Incarceration Darts (HID). You can find these weapons at various spawn points on planetary bases and inside stations/carrier. Unlocked inventory item: Portable Shield Unit. Full access to everything as we release/unlock them, regardless of entitlement. Access to items contained in the TAK as we release/unlock them. Access to only items contained in the Starter Kit. 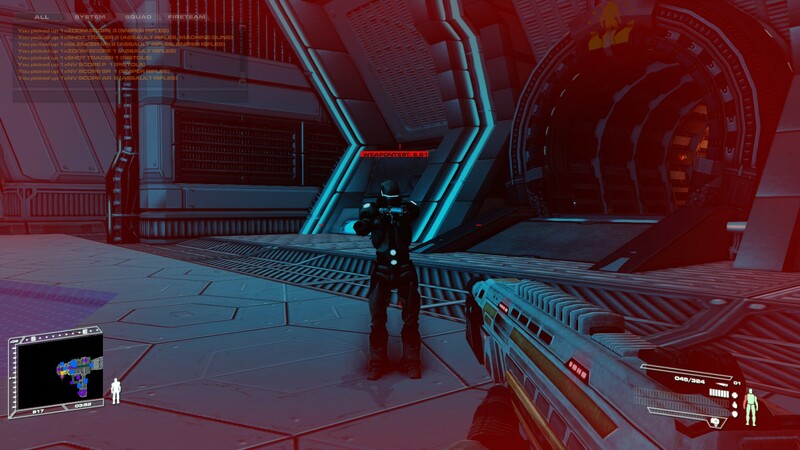 When someone is hit with an HID fired from a TKR9 weapon, they are immediately transported to the Detention Hold aboard the GCV-Starguard where they remain until the five mins timer expires or someone hacks (press + hold F until hacking complete) into the terminal in the hallway to disable the Detention Hold forcefield. Headshots are 100% lethal regardless of body armor, though shields (which you don’t yet have, lol!!) offers some protection. Life Factor (LF) is now tracked (0-100). Low is bad. Fatigue Factor (FF) is now tracked (0-100). High is bad. Affects all movement. e.g. the more you run, the higher the FF which will then limit your movement (walk, run, swim, jetpack etc) speed. Can use MedKit to heal (increase LF to 100, decrease FF to 0). Press 9 to equip item, then fire button to use. Can use (F) spawned Portable Weapon Pack to obtain weapons and ammo. Press & hold key to obtain full ammo and some spares mags. Can use (F) spawned Portable Medical Pack to obtain MedKits. Press & hold key to heal (increase LF, decrease FF) and to also obtain spare MedKits depending on inventory space. Added leaderboards ( http://lodgame.com/leaderboards ) which shows various stats for top 30 players. An in-game version (accessible from Escape menu) coming in next build. Added player seat locations in asset HUD. Green (vacant), Red (occupied). Use F2 to toggle the mouse. Then mouseover a seat to see the name of the person in. Added remaining player gesture animation poses (CTRL+6, CTRL+7, CTRL+8, CTRL+9). Try them out! FIXED: The view is exceedingly dark under water. This is a staggered release in which every aspect of the game will be unlocked and tested on a schedule. This first build features the Heatwave planetary starbase as well as the GCV-Starguard carrier in orbit around Lyrius planet. No weapons. No inventory items. No vehicles. No aircraft. No combat. This build – and the upcoming frequent updates – are for testing all the scenes (four planetary bases, four space regions, four stations, one carrier). The jetpack and wingsuit/wingchute are enabled. Please refer to the game manual for notes on how to get around the world.